Karen Carpenter during a photo session to promote her solo album. Karen Anne Carpenter (March 2, 1950 – February 4, 1983) was an important twentieth century female American pop singer, drummer, and with her brother, Richard Carpenter, were members of the band The Carpenters, one of the most successful musical groups of all time, selling to date nearly 100 millions units worldwide. Karen rubbed elbows with other famous drummers like Buddy Rich and Johnny Carson. She made the front cover on many national magazines and preformed in countries around the world. In Japan, in 1976, The Carpenters grossed the highest income for any tour in the history of Japan, up to that time. Karen's career started at the age of 19 (1969) and lasted 14 years to 1983 and her untimely death. Her death of anorexia, an eating disorder, brought that illness to light on a worldwide level and inspired The Karen A. Carpenter Memorial Foundation, established to help provide funds for a cure. The Carpenters made eight Gold Albums, five Platinum Albums and many top hit singles. They received three Grammy Awards and were voted "Best Band, Duo, or Group (Pop/Rock)" at the first annual American Music Awards. Karen became more of a vocalist, rather than a drummer, further on into her career, because of the logistics of the trap sets that made drumming and singing simultaneously too difficult. Her music was very popular with American girls and her elegance on stage set a role model for them. Critics often labeled her the "girl next door." Carpenter was born in New Haven, Connecticut, United States to Agnes Reuwer Tatum and Harold Bertram Carpenter.They resided at 55 Hall Street, New Haven, Connecticut. Harold, a printer by trade, was known to have been a collector of music albums and was said to have hung a swing in the basement of their home so that the children would be exposed to music while they played. They could hear the sounds of such artists as Les Paul, Mary Ford, Spike Jones, and Patti Page—all figures that played a huge role in the development of the Carpenter's music. Karen's mother, Agnes, was reportedly a domineering mother which may have caused some of her children's self destructive behavior later in life. When Karen was around 13 years-old, in June of 1963, their family moved to Downey, California, a suburb of Los Angeles. Her older brother, Richard, had developed an interest in music at an early age, becoming a piano prodigy. The move to southern California, with its many recording studios and record companies was intended, in part, to foster Richard's budding musical career. Karen attended Downey High School where her musical interests began to stir. She joined the band and learned to play her first rhythm instrument, the glockenspiel. She later learned to play the drums, inspired by the abilities of a marching band mate, Frankie Chavez. Karen began drumming on bar stools with a pair of chopsticks, adding accompaniment to her records. Her parents, seeing her interest, soon bought her her own set of drums and she could play them instantly. Drumming came naturally to Karen. She said in a 1981 interview, "I started right off playin', and time signatures came naturally... I don't know how, I mean, it felt so comfortable when I picked up a pair of sticks!". Karen practiced for several hours a day—her drumming can be heard in many of The Carpenters songs. Karen joined a band formed by her brother, Richard Carpenter, called The Richard Carpenter Trio (1965-1968). In the Trio, Karen played the drums, Richard, the keyboard, and a friend, Wes Jacobs, was the band's bass and tuba player. The jazz trio played at numerous nightclubs, and a television show called Your All American. They competed in the The Battle of the Bands at the Hollywood Bowl, playing Richard's Iced Tea along with The Girl From Ipanema. Richard, Karen, and Wes took top honors and were soon after approached by an RCA Records representative. The trio was signed to the label, cutting 11 tracks. This deal fell through however, with no commercial release. Karen and Richard attended college in Long Beach, California. There, along with two other musicians, Gary Sims and John Bettis, they formed an ensemble known as Spectrum. After Spectrum disbanded, Karen and Richard performed with a well-known sessions bassist named Joe Osborn (from the Magic Lamp Records). It was in his garage studio that Karen began her vocal career. There, Karen recorded the songs Looking for Love, I'll Be Yours, and The Parting of Our Ways. Karen Carpenter and her brother sent out many demos until they attracted the attention of A&M Records co-founder Herb Alpert. He, along with Jerry Moss, eventually signed Karen and Richard as The Carpenters to the A&M record label in April of 1969. There the Carpenters cut their first album Offering in which Karen sang most of the tunes. President Richard Nixon and the Carpenters at the White House, August 1, 1972. Their only popular single released from that album, the main track, a remake of The Beatles' Ticket to Ride, reached only to number 54 on the Billboard Hot 100 Charts. Their next release, 1970's Close to You was a certified number one smash record, with the title track and We've Only Just Begun as major hits. This began a long and very successful career. Among their numerous television credits were appearances on such popular series as American Bandstand, the Tonight Show with Johnny Carson, the Ed Sullivan Show, and the Carol Burnett Show. In 1971, Karen and Richard appeared in a television special on the BBC in the United Kingdom. They were also the featured performers in a summer replacement series, Make Your Own Kind of Music, which aired in the United States on NBC-TV. In May 1973, the Carpenters accepted an invitation to perform at the White House for President Richard M. Nixon and they also visited West German chancellor Willy Brandt. The Carpenters' popularity often confounded critics who accused their music as being bland and "saccharine." However, Karen's was praised for her control, sense of pitch, and the subtle personal expression she introduced to a melody. Their music focused on ballads and mid-tempo pop, and despite critics opinions, was extremely popular. The recording industry awarded the duo, three Grammy Awards during their career. These awards included Best New Artist, and Best Pop Performance by a Duo, Group, or Chorus, for Close to You in 1970; and Best Pop Performance by a Duo or Group for the LP Carpenters in 1971. In 1973, the Carpenters were voted Best Band, Duo, or Group (Pop/Rock) at the first annual American Music Awards. The Carpenters also had eight Gold Albums, ten Gold Singles, and five Platinum Albums. They had the most Top 5 hits in the first year of their business. Karen's obsession with her weight began early in her life. At age 17, she began the "Stillman" diet, under doctors supervision, and lost about 20 pounds from her 140 pound weight. It seemed that Karen would wrestle with her weight for the rest of her life. She dieted obsessively and developed the disorder anorexia nervosa, which first manifested itself in 1975. At one point in her career, she dropped down to just 80 pounds and with a 5-foot-4-inch height she was literally starving herself. By the mid-1970s, extensive touring and lengthy recording sessions had begun to take their toll on the duo and contributed to their professional difficulties during the latter half of the decade. Exhaustion and emaciation forced Karen to cancel concert tours in the UK and Japan. She fainted once, on stage during one of her performances of the "Top of the World" in 1975 in Las Vegas, Nevada. At the same time, Richard developed an addiction to Quaalude, which began to affect his performance by the late 1970s and led to the end of the duo's live concert appearances for several years. On September 4, 1978 The Carpenters gave a concert at the MGM Grand in Las Vegas and did not perform again on stage until the 1981 Made in America (Carpenters album), which would include their final live performances together. While Richard sought treatment for his addiction at a Kansas, Kansas facility in early 1979, Karen, who was currently at the age of 30, made a solo album with producer Phil Ramone entitled "Karen Carpenter,", which she dedicated to her brother Richard. The choice of more adult-oriented and disco/dance-tempo material represented an effort to retool her image. Arguably, her best ever performance is a song on the album by Paul Jabara and Jay Asher, called "Something's Missing (In My Life)." Many who have heard the work-lead feel it truly relates to Karen's personal struggles and depth of her feelings. The song remains unmixed and without strings. The resulting product met a tepid response from Richard and A&M executives in early 1980, and Karen wavered in her dedication to the project. The whole album was shelved by A&M executive Herb Alpert. Karen's fans got a taste of the album in 1989 when one of its tracks, "If I Had You," (as remixed by Richard) turned up on the compilation album Lovelines. It was also released as a single, making number 18 on the Adult Contemporary chart. Sixteen years later in 1996, the entire album, featuring mixes as approved by Karen and one unmixed bonus track, finally saw release. There are 10 unreleased tracks from the album: eight of them are work-leads, while the remaining two are considered outtakes: "I Love Makin' Love to You," and "Truly You." When A&M Records folded in 2000, six out of the eight demos began surfacing on the Internet. Carpenter lived with her parents until her mid-20s, although ironically after the Carpenters became successful during the early 1970s, she and her brother bought two apartment buildings in Downey. Called "Close To You" and "Only Just Begun," the "Close To You Apartments" can still be found at 8356 East 5th, Downey, California. Karen's innocence and love for life was displayed in her Disney memorabilia collection and her love for softball/baseball. Petula Clark, Olivia Newton-John, and Dionne Warwick were friends of Carpenter, even as she struggled with anorexia. After a whirlwind romance, on August 31, 1980, Karen married real estate developer, Thomas James Burris. At the time they met, Tom was a 39-year-old divorcé with an 18-year-old son named Mark. Karen was 30 years-old. They were married at the Beverly Hills Hotel in the Crystal Room. A new song performed by Karen at the ceremony, Because We Are In Love, surfaced in 1981. The newly married couple went to Bora Bora for their honeymoon, where Karen called her family from the island and described it as "Boring Boring..." The marriage turned out to be a disaster and they separated in November, 1981. The song Now, recorded in California, April 1982, was the last song Karen ever recorded. Karen took an intermission and underwent therapy in New York City with noted psychotherapist Steven Levenkron for anorexia. At that time, anorexia was a relatively unknown disease. In the midst of her therapy, she befriended recovered anorexic Cherry Boone, and crocheted a sign above her hospital bed that read You Win, I gain! After her recovery, she planned to go public about her battle with anorexia. Karen returned to California permanently later that year, determined to regain her professional career, finalize her divorce and begin recording a new album with Richard. Karen had gained a total of 30 lbs. over a two-month stay in New York, but the sudden weight gain (much of which was intravenously fed) further strained her heart, which was already taxed and weak from years of dieting and abuse. At the height of her illness, Karen, who had a normal thyroid, was taking ten times the normal daily dose of thyroid replacement medication (equivalent to 1 mg, as opposed to the normal 100 mcg dose) in order to speed up her metabolism, which combined with large amounts of laxatives (between 90 to 100 a day), weakened her heart, digestive and nervous system even further. On February 4, 1983, at the age of 32, Karen suffered cardiac arrest at her parents' home in Downey and was taken to Downey Community Hospital where she was pronounced dead 20 minutes later. Karen was planning to sign her divorce papers on the day she died. The autopsy stated that Karen's death was due to emetine cardiotoxicity due to anorexia nervosa. Under the anatomical summary, the first item was heart failure, with anorexia as second. The third finding was cachexia, which is extremely low weight and weakness and general body decline associated with chronic disease. Emetine cardiotoxicity implies that Karen abused ipecac syrup, an easily obtained emetic medicine that is intended for people to take who have accidentally swallowed a poisonous substance. Her funeral service took place on February 8, 1983, at the Downey United Methodist Church in Downey. Karen, dressed in a rose colored suit, lay in an open white casket. Over a thousand mourners passed through to say goodbye, among them her friends Dorothy Hamill, Olivia Newton-John, Petula Clark, Cristina Ferrare, and Dionne Warwick. Karen's death brought lasting media attention to anorexia nervosa and also to bulimia. It also encouraged celebrities to go public about their eating disorders, among them Tracey Gold and Diana, Princess of Wales. Medical centers and hospitals began receiving increased contacts from people with these disorders. The general public had little knowledge of anorexia nervosa and bulimia prior to her death, making the conditions difficult to identify and treat. Her fame and her "wholesome" image may have made people reluctant to suggest the possibility that she had a problem, much less to intervene directly. Her family started the Karen A. Carpenter Memorial Foundation, which raised money for research on anorexia nervosa and eating disorders. Today the title has been changed to Carpenter Family Foundation, and in addition to eating disorders, the foundation now funds the arts, entertainment and education (including arts in education). On December 11, 2003, at 12:30 PM Pacific Standard Time, Agnes, Karen, and Harold, who remained in their original caskets and occupied three out of the six spaces in the Carpenter Private Mausoleum, were exhumed from the Forest Lawn Memorial Park in Cypress, California and re-interred at the Pierce Brothers Valley Oaks Memorial Park in Westlake Village, California. Their mausoleum is a 46,000-pound, Partenope-style structure and was constructed in Texas over seven months. It is polished sunset red, and features crystal patterns. It is located in the Tranquility Gardens section of the cemetery. Similar structures constructed at the time had a price range around $600,000. "A Star on Earth - A Star in Heaven" is written on Karen's mausoleum stone. ↑ Ancestry of Richard and Karen Carpenter, William Addams Reitwiesner. Retrieved June 5, 2007. ↑ Biography, Richard Carpenter, 2004. Retrieved June 5, 2007. 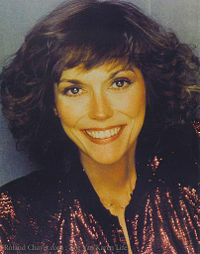 ↑ Karen Carpenter Biography, HotShotDigital. Retrieved June 5, 2007. ↑ Biography, Richard Carpenter. Retrieved June 5, 2007. ↑ Ray Coleman, The Carpenters, The Untold Story. HarperCollins, 1994. ISBN 9780060183455. Richard and Karen Carpenter - Official site. This page was last modified on 12 April 2018, at 13:49.